This post has been worth the wait! 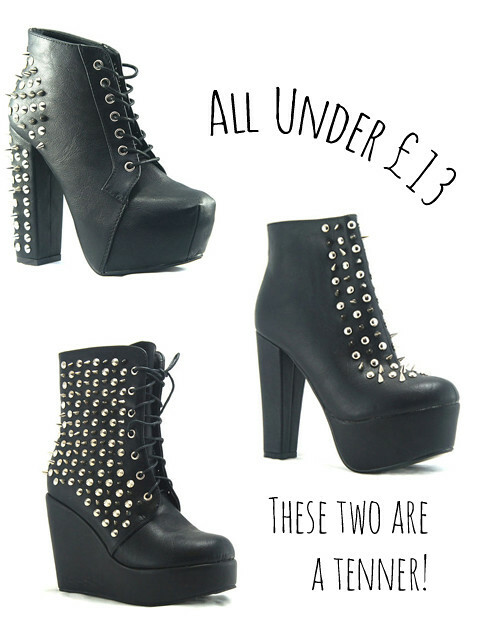 Black, spiked boots for under £13 each - you heard me! I'm a massive fan of boots and pretty much exclusively buy them in black. In fact, most shoes I buy are black, bar a few that come out on the odd occasion when I'm feeling a bit jazzy. All three pairs are available in different colour and fabric variations if black faux leather isn't your thing, or you prefer a pop of colour on your feet! This is another case of the "please buy these so I don't" post, just like this shoe post was, which featured UNIF Hellbound and Jeffrey Campbell Nightwalk dupes. I don't actually own any spiked shoes but I think they'd be absolutely ideal to jazz up a simple dress... ok time to stop imagining outfits with these shoes now! Otherwise I might somehow end up on the PayPal page! Although it's probably best I don't... as it would most likely result in a serious injury of some variety knowing me. Ps. Outfit posts will resume very soon! Great choices :) I can't believe how inexpensive they are!! Robyn you always find complete bargains! Love the lita-a-likes! Wow love that last pair, great find! The wedge ones are super cool, I don't know how you find all these bargains! Ive beeeen searching for jc dupes everywehre! Perfect! !